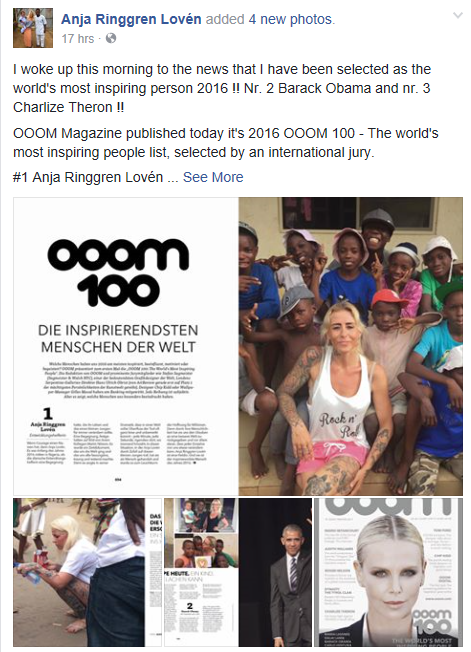 Nigerian-based Danish aid worker, Anja Rinngren Lovén topped the OOOM 100: THE WORLD'S MOST INSPIRING PEOPLE list. Lovén, whose rescue of a two-year-old Hope, who was branded a witch by his family and left to die, touched the world and has topped this year’s OOOM 100 ranking of the world’s most inspiring people. U.S. President Barack Obama is number 2, followed by actress and activist Charlize Theron. Pope Francis, Leonardo DiCpario, the Dalai Lama, Marc Zuckerberg, and Bob Dylan are in the top ten. 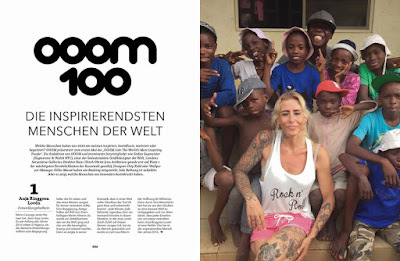 OOOM's new issue is on newsstands from December 9, in Germany, Austria, and Switzerland. She took to her Facebook account to share her excitement, the aid worker, however believe the award should go to her husband, David Umem and all the workers at the children's home in Akwa Ibom. "I woke up this morning to the news that I have been selected as the world's most inspiring person 2016 !!" To see my name at number 1 is really amazing. I'm like WOW !! I'm so speechless and I'm very honored. 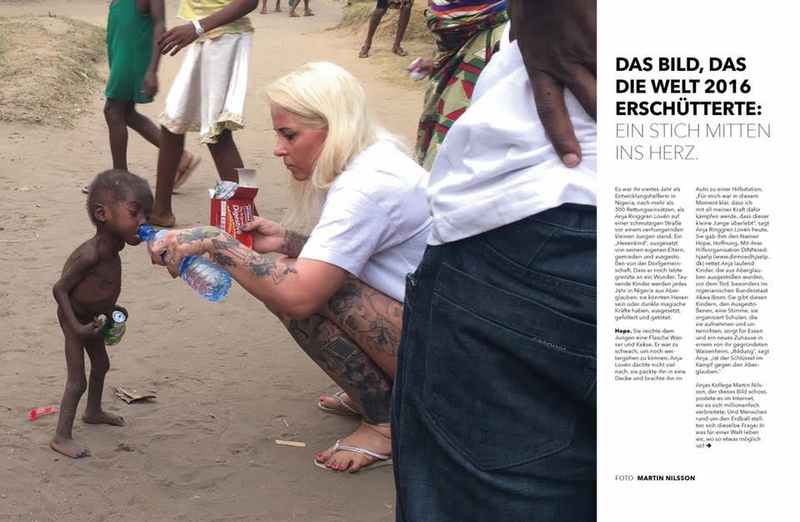 This is such an important acknowledgement of DINNødhjælp/ACAEDF humanitarian work in Nigeria. But as I have said so many times before. I'm not alone. I'm surrounded by the most hard working and devoted team members in the world. Our strong leader and my mentor for life, my husband David Emmanuel Umen, and the following names should also be placed at #1." I woke up this morning to the news that I have been selected as the world's most inspiring person 2016 !! Nr. 2 Barack Obama and nr. 3 Charlize Theron ! !